The author in Vogue Patterns, June/July 2011. Photo: Jon Thorpe. 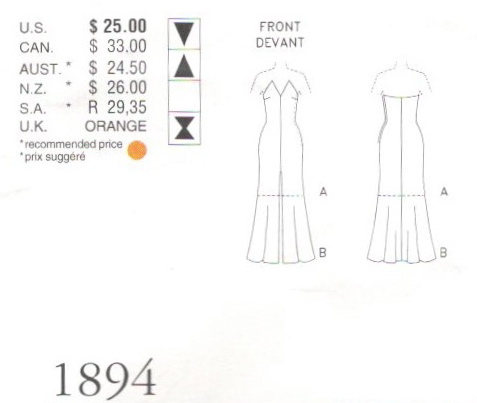 Here’s the envelope description: Misses’ Dress: Close-fitting, slightly A-line or slightly flared, lined dress, above mid-knee or floor length, has bust pads, foundation with inside belt, front slit and side zipper. Recommended fabrics: velvet, wool crepe, silk-like crepe. Unsuitable for obvious plaids. 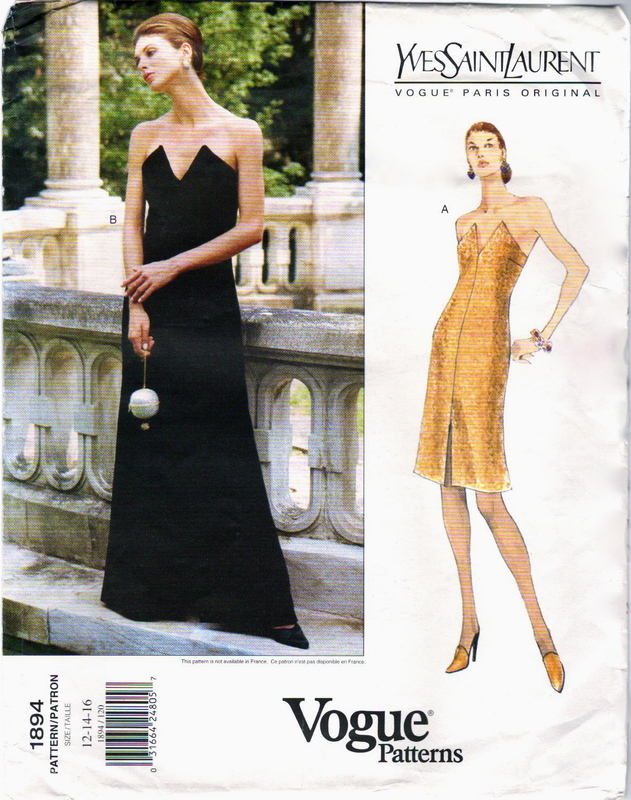 **Update: The Vogue 1894 design is from Yves Saint Laurent’s Fall/Winter 1996-97 ready-to-wear collection—you can see a runway photo here (Corbis photo here). Black Dark Island tartan by House of Edgar. Image: mackenziefrain.com. 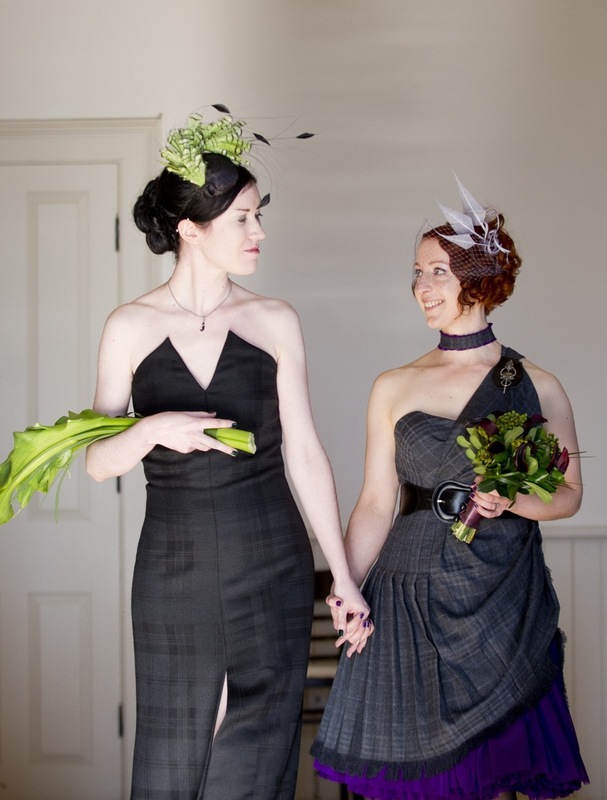 Despite my pattern’s warning about the unsuitability of plaids, I couldn’t think of a better choice, and we decided to order House of Edgar fabric for both our wedding dresses. Unfortunately I couldn’t find anyone in Canada who actually maintained stock of House of Edgar fabric. 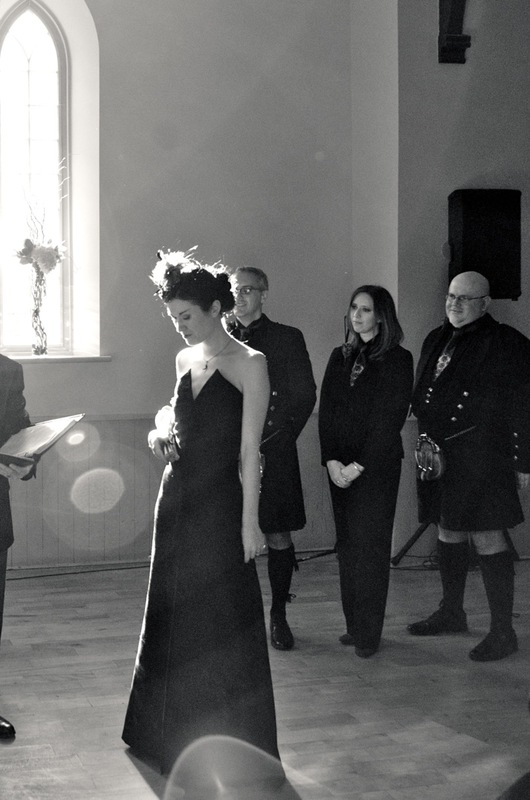 After corresponding with a number of merchants, including Kitchener’s Keltoi Gaelic Clothing and Jacobite re-enactment suppliers Mackenzie Frain, the most economical option proved to be ordering direct (through the House of Edgar retail site, tartankilts.com). Soon we had a courier package from Perth, Scotland containing several kilograms of wool fabric. I read everything I could find on tartan matching before daring to cut into my Dark Island fabric. I ended up using a technique I first learned of from the Selfish Seamstress (read her blog post here): cutting one set of pieces from a single layer of fabric, then flipping the pieces and using them to cut out the second set. The dress is underlined with silk lining from King Textiles, which gave each piece a luscious drape. To match a tartan perfectly at the seams, The Vogue Sewing Book recommends a basting technique called slip basting… but I just crossed my fingers and basted very carefully before doing the machine sewing. I’m really happy with the results. 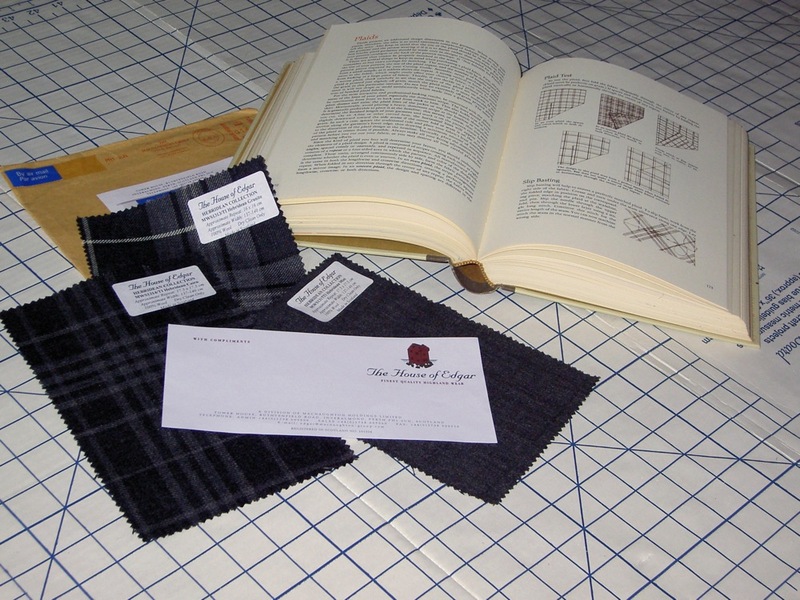 House of Edgar tartan swatches and the Vogue Sewing Book (1970). The pattern called for a boned foundation with inside belt and bust pads. This meant I needed spiral steel boning and boning tips, wire cutters, and pliers to fit the tips to the boning. (I got my boning and tips from Leather & Sewing Supply Depot Ltd. in Toronto’s garment district.) I found the boning didn’t handle well with the wire cutters and ended up using our bolt cutters instead. I love the mini-arsenal of hardware and tools that goes into making this kind of evening wear. Foundation with inside belt and bust pads, Vogue 1894. 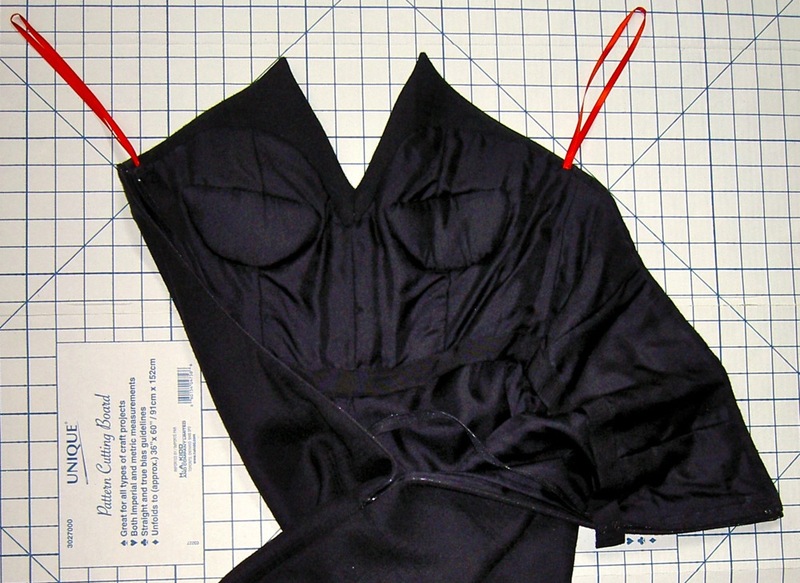 Finished bodice, Vogue 1894 by Yves Saint Laurent. Photo: Jon Thorpe. Wedding shoes revealed! (Camilla Skovgaard shoes.) Photo: Jon Thorpe. Left: Vogue 1894 by Yves Saint Laurent; right: dress by Ray Wong. Photo: Jon Thorpe. Wow, your dress looks amazing. I love your wife’s dress too. You both look beautiful. Thank you, I’ll pass on the compliment! That is so awesome….I love your blog, I found it through Paco. Must read every post! Absolutely stunning. 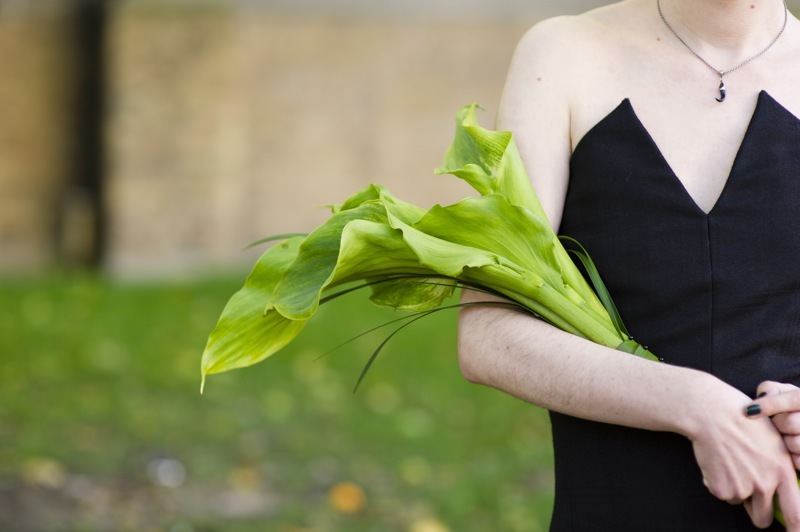 You made a beautiful dress! You certainly must get some credit, too – awesome pattern matching!